On Sunday, June 8, Carol Erickson (left), KYW-TV meteorologist, spoke at the Evesham Township Library about her passion for pet ownership and adoptions. 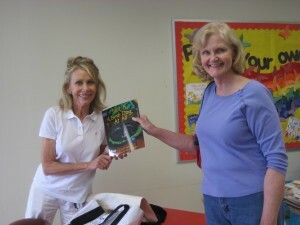 Judy Matthews (right) received a signed copy of Erickson’s children’s book, “Not a Used Dog, At All.” Proceeds from Ms. Erickson’s book will be given to animal rescues and shelters. Animal shelter organizations in attendance were The Forgotten Angels Equine Rescue, The Animal Orphanage, The Animal Welfare Association and The Burlington County Animal Shelter. These associations discussed their commitment to finding homes for their rescued animals and responsible pet care. Rabbits, mice, and cats were available for adoption. This program was sponsored by The Friends of Evesham Township Library.